A former gangster rap artist turned Catholic Hip-Hop Evangelist/Apologist. During the late 80′s and early 90′s, his hometown of Fort Worth, TX reported the highest overall crime and murder rate per capita in the US. It was very easy to fall into a gangster mentality and lifestyle. He became involved in gangs, drugs, partying, and many other aspects of that lifestyle. As a means of venting and an escape, he began to write and record “gangsta” rap. He began pursuing a hip-hop career with a local record label and later formed the group Southern Kappin' Soldiers. While with SKS, he toured frequently and shared the stage with many major recording artists such as Bone Thugz n Harmony, Cypress Hill, SPM, and many more. It was at an “all ages” gangtsa rap concert that he understood the impact his music had on his young audience. Christ pierced his heart and convicted him of his sin. This was the beginning of his conversion and his journey home. Though C2Six was born and raised a Catholic, he never took it further than going through the motions. Having a lack of understanding of his faith, he was led out of the Church. At one point, his outlook was anti-Catholic and began church hopping in a search for truth, a truth that would eventually lead him back to his Catholic roots. He strives to be true and authentic in both his ministerial efforts of promoting the Gospel and his artistic endeavors as a hip-hop artist. He takes his ministry serious and helps spread the message through the arts of hip-hop under the spiritual guidance of Father Masseo Gonzales aka El Padrecito, a Franciscan Priest from Richmond, CA. He is not afraid to speak out and be true to the Catholic faith and the Magesterium of the Catholic Church. He lives in Fort Worth, TX with his lovely wife of 18 years with his 2 beautiful children. He has a passion for working with under privileged, at-risk youth, troubled teens, gang members, and prison ministry. John Levi is an American Southern Hip-Hop artist born and raised in Tampa, Florida. A former college football player as well as a club bouncer, he has then found his mission and answered the call to spread the Good News as far as it can reach using all of the resources he has been given. He offers no apologies bringing a deep psychological approach to revealed Truth & how it applies today with his Bachelors in Psychology and Masters in Counseling - Applied Behaviors Analysis. Nico Santana is a Colombian born, Florida raised bilingual Hip-Hop artist, music, and video producer. Influenced by 90’s Hip-Hop, R&B, and Latin music, he brings a unique sound to his listeners. His passion and love to motivate, unite, and uplift are embedded into each lyric relating to the daily struggles and joys of life as a husband and a father. 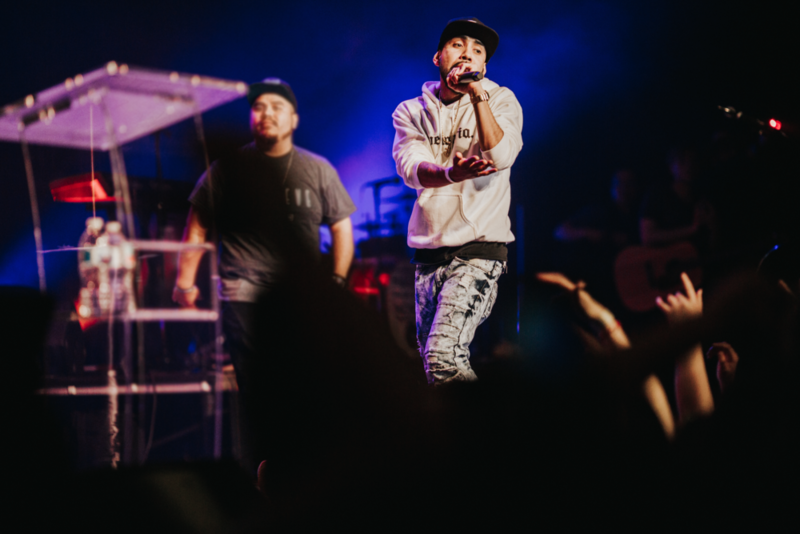 Starting early on in his career, Nico shared his talents as a member of the faith-based hip-hop group, FoundNation while growing his audience as a solo artist as well. Nico has toured and played at venues in NYC, Miami, Nashville, Los Angeles and more. He has also gone internationally to play in Canada and Brazil. With over 100k views on YouTube, 90k plays on SoundCloud, and an audience of 25k and growing, Nico Santana is just getting started. Born in Guatemala City, Val Mural was just three years old when in 1989, his parents brought him and his siblings to the U.S, "Homie, I feel so alive" (Bone-Z-Bones, Words Cry.) Two years later his mother left his father and took Val and his three siblings with her. They moved to a small city in the outskirts of San Diego. While jumping to different shelters and going from school to school, Val began writing music at an early age. It wasn't until his early teen years that he got into the hip-hop scene. In high school he found himself getting into a lot of trouble and was even expelled. He ended up in jail a few times as a young adult and was seeking guidance in his life. While still doing music he continued to live life like a normal person and after meeting his wife he became a father to his first born little girl and years later to a son. After an unfortunate split, Val Mural has then dedicated his life to his children and to a life of penance and prayer. Having laid a foundation of Faith in the Church, Val Mural continues to grow as a father, a man of God, and an artist trying to make more positive music and lead people to Christ, as he continues to seek God himself. There is more to come from Val Mural and soon the world will hear what he has to say. Alfonso Pedroza aka S.M1nd is the oldest of 4 children. Born in Mexico, he migrated to the U.S.A. at only 9 months of age with his mother ending up in Santa Ana, California for over two decades. He grew up in what seemed like a normal environment, but was then exposed to the "wild side" of life through bad influences and a broken home. His father loved to drink and his mother was a depressed soul, but sooner than later, they both met the Lord when Alfonso was only entering his teens. Having given their life to prayer and penance, Alfonso soon had an encounter of his own. He began to feel a void all while being indulged in marijuana, skipping school, gangs, partying and heavy promiscuity. His mother saw him slipping away from their grasp and invited him to a retreat. That same weekend just a couple of days after his 17th birthday, he decided to give His life to the Lord. Struggling to let go of what felt like a comfort and pleasing life, he allowed the Lord to work in his life and he began to slowly leave everything that didn't help him get closer to God, his Faith, and his family. Now, more than over a decade of serving Christ and His Church, he forms part of a Hip-Hop group named FoundNation and has traveled all around the country performing together with El Padrecito as FoundNation Family. Alfonso lives happily married to his wife Kalena in Houston, Texas with their daughter and son. He continues to dedicate his time, treasure, and talent to serving the youth and young adults and marriages and families through his music and service together along with his wife.